I happened to be going out to dinner by myself, so I popped into the bookstore for some reading material while I dine. I did not want any Tolstoy-style epic because I would not even be able to read one chapter. 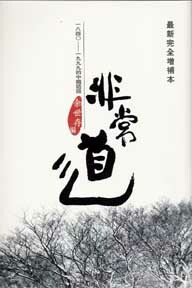 So I picked up Extraordinary Sayings (非常道) by Yu Shicun (余世存). This book was a bestseller in mainland China, and I am reading the expanded overseas version. The concept is very simple: the author has read hundreds, if not thousands, of books over the years and he took notes of certain extraordinary sayings. This book is the collection of those sayings. Personally, I do not like to read historical narratives that are based upon some form of structure as determined by the author(s). I do not believe that the history of China from 1840-1999 can be reduced to a structure that is simplified to the point that humans may think that they grasp. I believe that such a strategy is ultimately misleading. This book does not impose a structure. In fact, it can be picked up and read from any page without missing a beat. I read it and enjoyed the human qualities over Chinese history. In the following, I have randomly selected some of the sayings and translated them for your enjoyment too. I laughed, but I also lamented. In 1962, Nobel Physics laureate C.N. Yang met his parents in Geneva. At the time, Yang had been working in the United States and knew very little about the actual conditions in China. Yang's father said that the New China really helped the Chinese people to stand up proudly. In the past, they did not know how to manufacture even a needle, but now they can manufacture automobiles and airplanes. In the past, there were floods that killed millions of people, but nothing like that happens today. In the past, there were illiterate people everywhere, but today at least all the small children in the cities can attend school. In the past ... today ... as he merrily talked on, Yang's mother interrupted: "Don't just talk about that. I had to wake up in the dark of night in order to buy bean curd. After spending three hours in a queue, I managed to buy two broken pieces. What is so good about that?" When Li Hongzhang (李鸿章) was the governor of Hebei province, he brought his mother to live with him in Tianjin. His subordinates all invited her to banquets in order to please their boss. When her mother went about in the sedan-chair carried by eight men, she always showed her natural unbound feet outside the curtain and the sight always caused a sensational scene in the streets. Li Hongzhang was embarrassed and begged his mother to be less flagrant. Her mother got into a rage: "Your father did not dare to say that back then. Without these big feet, how could you afford to study and become an official?" Then she laid down in bed and refused to eat for three days. Li Hongzhang had to kneel outside for three days in a row to beg for forgiveness. Thereafter, he let his mother have his way. During the Cultural Revolution, the people criticizing Chen Jingrun (陈景润) said: "Let the Goldbach conjecture go to hell! What is so big deal about 1+2? Isn't 1+2 equal to 3? You eat the food grown by peasants, you live in a house built by workers, you are protected by the People's Liberation Army and your wages are paid by the nation so that you can study 1+2. What is this? This is fake science!" So Chen jumped on the table, went through the open window and leapt downwards. But when he jumped out of the third-floor window, he was nicked by an awning and therefore only suffered some scratches on his leg when he landed on the ground. A rebel leader looked at Chen and said: "It is no wonder that you are a famous mathematician. You even know how to select the angle when you jump out of the window!" In January 1988, the old and ill Chiang Ching-kuo (蒋经国) passed away The conservative wing of the Nationalist Party wanted to smear the Democratic Progressive Party and let this information be known: more than half a month ago, the legislators from the Democratic Progressive Party held a mass protest in parliament and this accelerated the death of Mr. Chiang. Later on, witnesses said that Chiang Ching-kuo had said: "There will be some disorderliness in a democratic system. Sometimes, there will be infelicitous situations, especially some chaos that will make the leader uneasy. We must accept these conditions." The parents of the poet Wen Yiduo (闻一多) arranged a marriage for him back in their home village. Wen was quite unhappy, but after the poet let off the steam and released his rebellious emotions, he went back to follow etiquette and obey tradition. However, he insisted on this only condition of marriage that "he be allowed to reform/transform his new wife in the village." He told his parents: "... I am willing to sacrifice myself for the family, but I ought to do this of my volition. The only thing that I ask of you is that you let my wife get an education. You love your son and you should not overrule this request ... if you persist on then obstinate traditional ways, I will run the risk of being impious by calling you insensitive!" In early 1947, Xu Zhucheng (徐铸成) rejected the Nationalist government's proposal for investing 1 billion yuan to gain controlling interest in his Wen Wei Po newspaper. Right in front of Nationalist bigwigs Chen Lifu (陈立夫), Wu Guozhen (吴国桢), Xuan Tiewu 宣铁吾); Pan Gongzhan (潘公展) and others, he said: "Wen Wei Po was brought up with my ink" and "I will not accept subsidies or politically motivated investments from anybody." At the end of the conversation, the Shanghai Military Police Headquarters Commander Xuan Tiewu said: "I admire you. Frankly speaking, I had thought that you were a Communist. But after listening to you, I now know that you a warm-hearted patriot. It was not easy for you to take your position today. I, Xuan Tiewu, am sorry for having shut Wen Wei Po down for seven days previously. From here on, no matter how you criticize us, if I take any more action again, then I must not have not been brought as a human being." Xu Zhucheng said, "There is no need to exaggerate the case. I am just running a newspaper in accordance with my conscience." For her novel "Legend", writer Eileen Chang went down to the printing plant to do proof-reading. She was wearing some unusual clothing that day, and all the workers stopped their work to gawk at her. Eileen Chang was pleased with the 100% response rate and then commented to a female worker: "In order for people to look only at you out of many people, you should go and wear your grandmother's clothes." The female worker was shocked and said: "Wear my grandmother's clothes? That is like wearing funeral garb!" Eileen Chang said: "What does it matter, as long as it stands out?" Wang Xiao Bo (王小波) said that he lived through some special times during his childhood. One day, his father told his grandmother: "One mu of land can yield 300,000 jin of crop." So the old lady jumped up upon her tiny binded feet and screamed: "Even if you kill me, I still won't believe it!" In 1967, the Cultural Revolution was going full steam ahead. One day, several Red Guards charged into the home of Yang Mo (杨沫) to conduct a search-and-seize operation. One tough young man used a big axe to break apart Yang's closet and took away several hundred RMB, food coupons for 200 kilograms as well as a nice radio set. The young man was Ma Bo (马波), the son of Yang Mo, and he had acted with "the public interest over-riding private interests." Later on, Ma Bo traveled to southern China and wrote a letter to his parents. He did not refer to them as "Dad and mom" but addressed them by their names "Ma Jianmin (马建民) and Yang Mo (杨沫)." The letter came from the city of Nanning in Guangxi province. Ma Bo said that they were going to go to Vietnam to support the Vietnamese and resist the Americans and become "eternal heroes who will never return home." He said: "Good men should die on the battlefield." But next the letter changed its tone: "Please sent 500 RMB to the XXXX office in Nanning, or else you better watch what happens to your dog heads! You will meet with even more devastating attacks than the last time, etc." When the Chinese Communist leaders found out that Dr. Bethune was ill, they ordered a full-scale effort to save him. Zhou Enlai issued a secret order to the party underground in Shanghai to obtain penicillin and other essential medicines not available in the interior. The party underground leader had no choice but to look up Shanghai's big triad boss Du Yuesheng (杜月笙) for help. Du stared at the shopping list and did not say anything for a while. The party underground leader got anxious and slowly articulated one word at a time: "If Mr. Du can help, we promise that we will always remember this." Du Yuesheng sighed and said: "This list of medicine will be difficult to procure. This is a lot harder than the little things that I have helped you on previously. But if a foreigner was willing to risk his life to come here to help us Chinese fight the little Japanese ghouls, what can we Chinese say? Please proceed to the Huangpo River tomorrow night to pick up the material. Let us say that all related expenses will be donated by me." Ah Cheng (阿城) said: Many of my friends say that due to the extraordinary barbarity and severity of the Great Proletarian Cultural Revolution, great authors and great literary works will often appear about this era in which people were sent away into the countryside. I believe that this is a miscomprehension, because the cultural depth of the Great Proletarian Cultural Revolution is shallow and blind and therefore its opponents are restricted by its nature and become stuck at the same ideological level ... for example, critics have been recently saying that avant-garde novels have subverted the words of the authorities on the mainland, but the result of subverting the wizened and sterile words may be just as wizened and sterile. What does it mean to subvert the model essays used by middle-school students? In the second half of September 1971, Li Jiefu (李劫夫) was secretly listening to overseas radio broadcasts and learned that a certain Chinese aircraft had crashed in outer Mongolia. This indicated that something has gone amiss inside China. Mao Zedong was also said to be ill. On National Day, Li also noted that there were no celebrations as in the past, so he made the wild guess that Mao Zedong is seriously ill and Lin Piao had taken over. Li started to compose a song to make sure that he was ready to celebrate the ascension of Lin Piao. He put down on a music sheet the title: "Closely follow Chairman Lin to advance." When his wife Zhang Luo (张落) came in and saw that, she said: "Why are you writing this now? You better stop immediately!"